Thought I'd end this year by completing something I started earlier on. So many distractions this year, and the fun projects end up getting put to the shelf and forgotten. It's a Dunkleosteus, probably my all time favorite prehistoric fish (you can keep your megalodons). 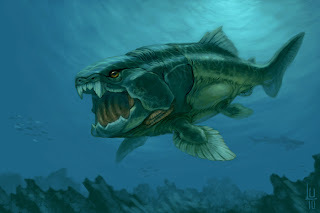 This guy's teeth look like they did some serious shearing, and with all that armor plating up front, Dunkleosteus took as well as he gave. Most portrayals of Dunkleosteus favor the 'ancient shark' approach, but I lean more toward the 'finned appendage' crowd, so I decided to make him look less a shark and more fish. In fact, I was heavily influenced by Big Mouth Bass; used to love fishing for them at my aunt's in the summer. They're a good choice, as there's a bit of similarity between the Denkleosteus and the Big Mouth Bass as far as their head plating and gill structure go. Anyways...Happy New Year, more updates to come! I had this idea of a Hunter image, but maybe with a bit of storytelling involved. At first glance, a Hunter stalks his prey. But there's more. This is not a Hunter in the usual sense; no bow, no spear...but swords instead. This isn't about food, it isn't about capture; it's about death. Blood has been shed, and this hunter bears arms to slay his quarry...for vengeance most likely. But as he closes in on his prey, so his prey draws ever closer to him. Who then, is the Hunter..and the Hunted? 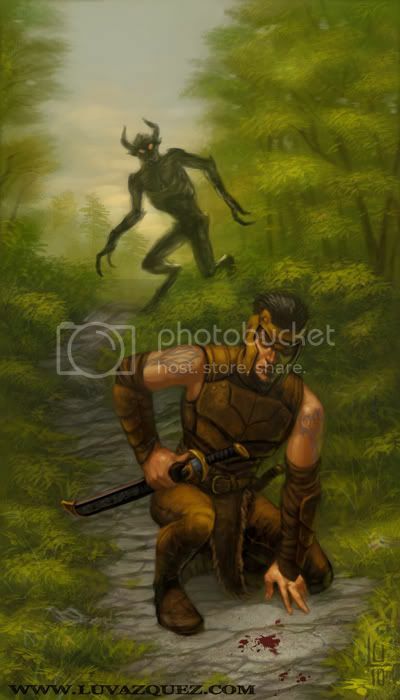 It occurs to me that being a freelancer is very much like being a Hunter. You're out stalking the wilds of the world, portfolio/weapon in hand hoping to bag that elusive Client who will provide sustenance for you and your family...at least until the next hunt. Interesting world, innit? The latest results of my gene-splicing experiments for the Mutation Nation challenge over at ArtOrder. 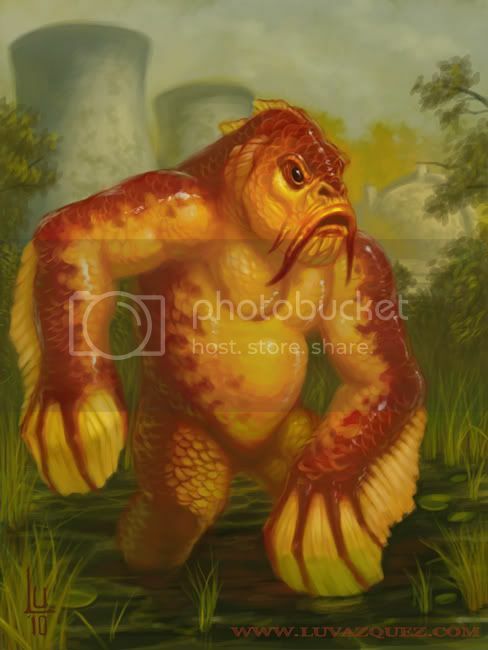 It's a melding of a Japanese Koi fish and a gorilla, a 'Koirilla' as it were. The colors are a bit nuclear for my tastes, but I suppose that's natural given the post-apocalyptic setting of Gamma World, for which this challenge is based. Had a lot of fun with this one, and I'm really liking the ala prima approach I've been using these past few paintings. It's much freer, more spontaneous and a bit frightening at times, but it keeps things interesting. Alas, my gene-splicing experiments must come to an end ...for now. The deadline's sunday and I'm away for the weekend. Koirilla...gasping for breath at a toxic waste swamp near you. My latest experiment in gene splicing for ArtOrder's "Mutation Nation" challenge. Consider it my contribution to solving world hunger. 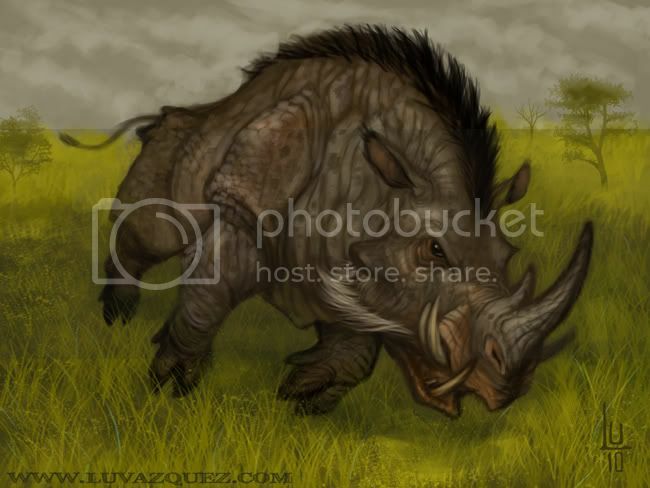 Part Wart Hog, Part Rhino, it's big, it's delicious with a bit of foul temper. It's Swineocerous...the other other white meat! 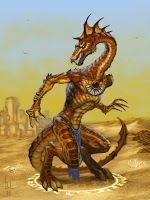 On a side note: Big ups to Jon Schindehette over at ArtOrder for his regular art challenges. Not only do they inspire the creative juices, it's a fun way for our little community to get involved and interact with each other. He's truly a gift and inspiration to artists everywhere, and I for one, am thankful for his tremendous generosity. ArtOrder had a sort of mini-challenge recently, the idea being your take on the Eye Tyrant, more commonly known as a 'Beholder'. 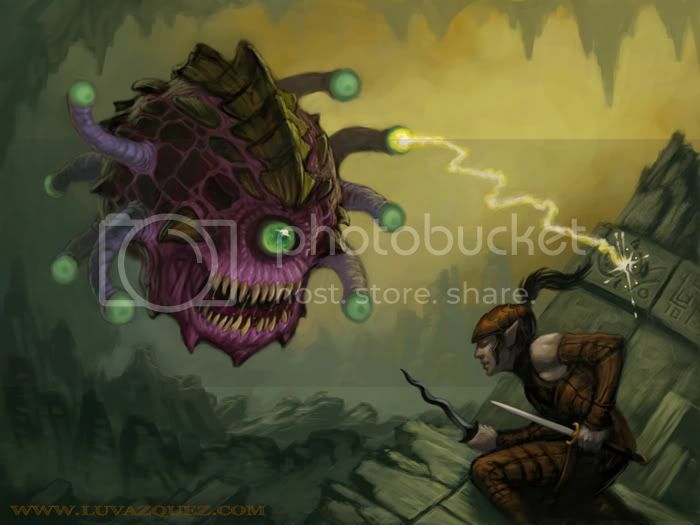 I submitted a speed-paint of an old-school Beholder; more armored sphere of eyes than the angry floating skull of doom type made popular by Todd Lockwood. Afterwards I got to thinking I wasn't quite done with the whole Beholder theme just yet. I felt like there was at least another Beholder painting in me that needed to see the light of day. This time around, I wanted the Beholder to look a bit more scary... like something you definitely don't want to meet while spelunking the UnderDark, yet still retain something of the old school Beholder. I'll probably tweak it some more here and there, but I think the Beholder urge has been satisfied with this piece...for now. Last night I received a great compliment about my work, in that the person making it was honestly unaware that the body of my work in the last year or so was entirely digital. But what makes this particular instance even more of a compliment to me is that this person is someone who I've known since my days at art college. Someone who is very familiar with my work before there was such a thing as 'Digital Illustration'. Back when I was pushing thick swaths of oil paint across painstakingly prepared Masonite or Illustration board. Back when every image began as a broad, flurry of shapes, color, and light; slowly but surely carved into focus and detail where needed. I say it's a compliment because when I made the decision to 'go digital', one of the things I wanted to preserve was the look of traditional painting technique. Easier said than done when the majority of the information on painting digitally is based on techniques that more often than not, result in some very obviously digitally rendered images. My last image, Cthulhu, and now this latest are the result of a 'new' approach I've been trying out while painting digitally. Up until Cthulhu, my images have been the result of all manner of photoshop techniques; complicated layering, image/color manipulation, masking et al. With Cthulhu, I decided at the onset to simply paint like I used to, and to just lay down broad shapes, color and light, refining those further and further until an image began to appear. I chose to limit the amount of layers, and even moreso, forgo as much of the little photoshop tricks and techniques that seem to scream at you from so much of today's digital art. If a color needed changing, I simply painted it in. If this arm wasn't quite right, I repainted it etc. Ironically, going 'back to basics' seems to have not only sped up my painting, but really made the entire approach a bit more enjoyable. I would even venture to say the images are better. "That is not dead which can eternal lie..."
That I love H.P. LoveCraft is no secret to those who know me. In my opinion he's one of the greatest writers of Modern Horror and has probably influenced the genre more than any other. And to love the man, you must love the monster who's essentially the icon of H.P. Lovecraft's worlds... Cthulhu High Priest of The Old Ones. I decided to base my Cthulhu on the scattered and vague descriptions found in Lovecraft's seminal "Call of Cthulhu". Here he's described as "vaguely anthropoid..bloated, corpulent..." with a "Octopus-like head whose face was a mass of feelers". There's a little conflict when he describes the wings though. In one description, they're "rudimentary..." and in another they're "long and narrow..." I opted for the rudimentary description, since I didn't really see such a massive, bloated figure flying under the power of his wings. Maybe at one time before the fall of Ryleh perhaps. 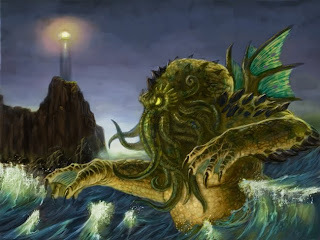 Cthulhu is also described as "Miles high...a mountain walked or stumbled". I scaled him back a bit and chalk the size as a little exaggeration of the witnesses who were no doubt driven to immediate madness upon the sight of the monster. Overall a fun piece to work on, a definite labor of love as it went 3 revisions before I was happy enough to go to a finish. Cthulhu fhtagn! Art is truly an addiction. Earlier today, I underwent some intense oral surgery. I had 2 impacted wisdom teeth that simply had to be removed and complication after complication arose during the procedure; one of the teeth cracks, another is fused to the jawbone, not enough novocaine et etc. What at all does this have to do with art, you ask? Well, throughout the harrowing experience, I remained fairly calm and relaxed, much to the surprise of the doctor. He later commented on this, to which I responded "Just thinking good thoughts Doc". What I was actually thinking of was a painting I'm working on, and how much fun I'm having with it, and how I can't wait to get home and start working on it some more. 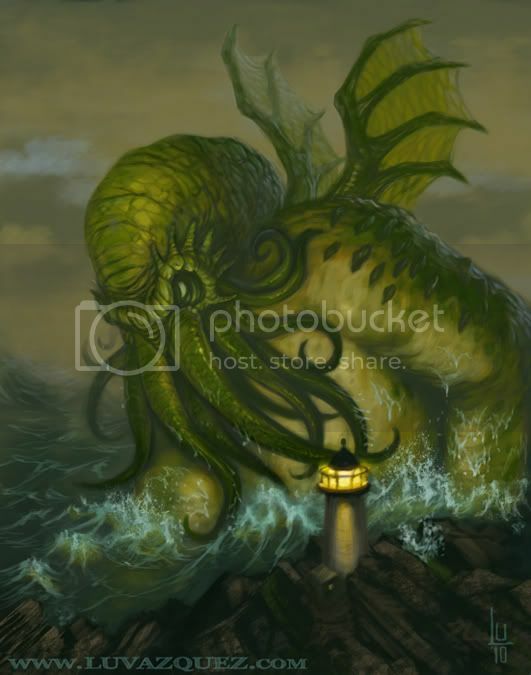 It's an image of Cthulhu, High Priest of the Old Ones from H.P. Lovecraft's mythos. I've decided to post one of the abandoned, unfinished versions. The image itself has given me no small amount of frustration, and the current version I'm working on is the third attempt. But I love the character, I love the lore behind it and most of all, I love love love art. Doing some much needed maintenance on my various image files. A little editing, but mostly arranging, deleting extraneous reference and interim saves which are no longer needed. Painting digitally is no different from traditionally in this sense. When I used to paint in oils, after each painting, there was always the cleaning of the work space, the clearing away of the dreck that inevitably builds up around you while you're in 'the zone' and can't be bothered to toss that empty chicken nuggets box so it actually goes into the garbage instead of the floor. Or the crumpled rolls of masking tape stuck to your taboret etc. The cleanup is important though...even digitally. It frees up memory and space on your drive, sure. But it also preps you mentally for the next image...refreshes your perspective, as it were. On a side note, I admit it...I got lazy with the cityscape behind my original Dragon King image, and it's been haunting my dreams ever since. So today I buckled down and revised it. Still not 100%, as non-organic forms are kryptonite for me, but I'm determined to change that by and by. Original's on the right. 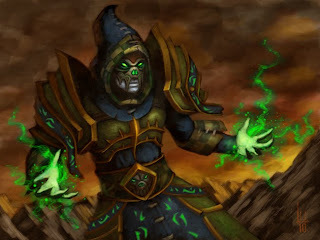 A Warlock from the World of Warcraft mmorpg. A bit of a problem getting started with this image, as I was struggling to keep it faithful to the game design. But the color scheme as depicted in the game just wasn't working for me. In the end, I tossed out Blizzard's version, and went with a color scheme of my own. A bit un-professional, I know...but in the end, it looks better and I'm happy with the results. My sister's opened up her very own shop on the web, which features merchandise centered on Puerto Rico and Boricua pride. What's this to do with me, you ask? Well, I'm working on a few images that will be showcased on her merchandise and if you're so inclined, head over to Islawear where you can buy a T-Shirt, Mugs, Print, Mousepad etc with my artwork on it, and display your Boricua pride! Blizzard finally posted a piece I did back in August '09. 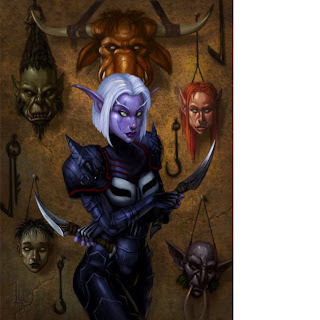 It's a piece of fan art for their World of Warcraft mmorpg, and I was beginning to wonder if they were ever going to post it, or if it had gotten lost in the shuffle. I like the image, though looking back, I can see where I'd do some things a little different. Isn't that always the way though? No painting is ever really finished; there's always some small detail to tweak, or some accent to jot. There's an old saying "It takes two artists to make art...one to create it, the other to tell them when it's finished". 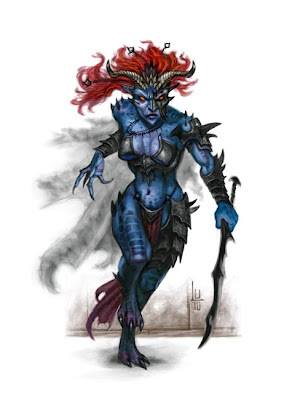 My entry for the latest challenge over at ArtOrder; a re-envisioning of the Assassin Devil, one of the denizens of the Abyss. Looked fun, it's supposed to look like an actual vignette from the Monster Manual. Overall I'm pleased with how it turned out, but painting this image served to spotlight something in my work that has always...troubled me. One of my major artistic challenges is getting rid of these outlines I tend to surround my figures with; it's like I'm afraid to paint over them and fill all the shapes and just let the color and and light define the composition. Mind you, there are great artists where the drawing is featured prominently in their images, and they do gorgeous work...Carlo Arellano comes to mind. And maybe I should just embrace that way of painting. But something inside screams Alla Prima! which I know for a fact is possible with digital medium. I need to summon up the courage to paint outside the lines again, like we all used to before we were taught not to. Dark Sun! Dragon Kings! Aaaagh! 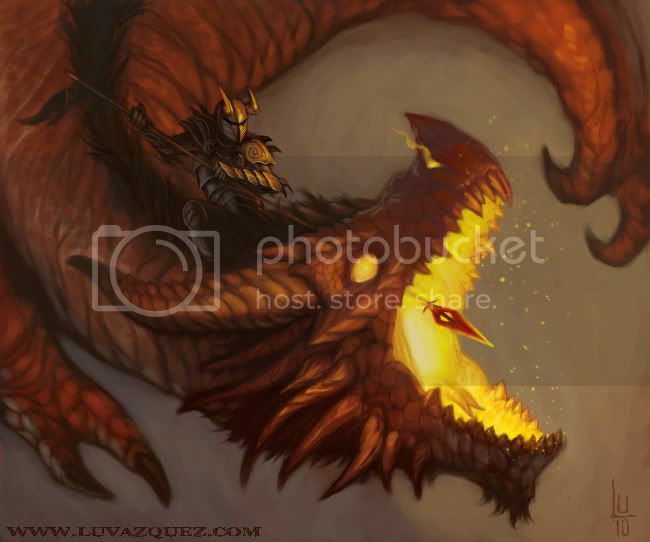 Well, needless to say I was inspired by this news to paint a Dragon King image. Ok, so maybe it's more of a Defiler enacting the ritual for the next stage of his Dragon King metamorphosis, but you get the idea. The website is updated to include the latest images. Link's to your right. I feel it's finally finished, and I'm ready to take the next step and start approaching Art Directors. Wish me luck. I love the monsters, truly I do. Can't get enough of them to be honest. But every once in awhile, I feel the need to paint some regular folk. Just people. 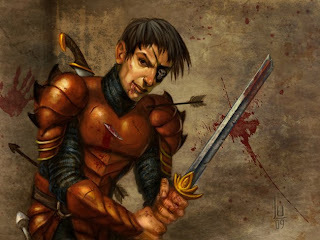 Blades a' flashing, plated armor glinting in the fading light, defiant heroism...and blood everywhere. No antennae, no feelers, no gills, claws, glowing eyes et al. Just...people. Of course, having said that I'm suddenly gripped with the urge to paint something creepy crawly with antennae...and gills...and claws...and and glowing red eyes! So lately, with all this digital mayhem going on, I've found myself looking at art by the Old Masters and wondering if I could maybe capture some of that feeling and influence into my digital work. I dug up an old sketch and decided to paint it up, and try to incorporate a bit of Old Master goodness and see what happens.